Lagos won my heart, as it has everything I wanted from an old European coastal town. The Coastline is basically stunning, the ocean crystal clear, it’s even pretty interesting under the ocean. Praia do Camilo Beach is the perfect postcard beach, amazingly crystal clear waters, the sand close to the ocean is like brown sugar with tiny smooth coloured glass stones, further up by the rocks it’s gets finer and softer, this beach is great for snorkelling, you can spot large schools of fish. Exploring the caves on our floats and blow up boat was really fun too.. This beach has a man made tunnel through the rocks to a second beach. It has very calm waters because of how protected it is. There is quite a few steps to climb down but it’s not too bad, well going down isn’t too bad..going back up can take the breath out of you, there is a restaurant at the top where you can cool off with a nice cold drink or Ice Cream and there are toilets that you can use to get changed. Praia do Pinhao was our closest beach and was also really very pretty, again the ocean was cyrstal clear, sometimes we would look down into the waters and it would slightly mess with your mind as to how clear it was, this beach is quite similar to Camilo beach with maybe fewer steps to climb down, but the steps are a bit broken up, so you would want to have your wits about you whilst climbing. The snorkelling here was probably the best for us, we saw heaps of quite large fish, the clarity was superb. This beach is a bay with a natural rock archway leading on to another beautiful beach. Bandeira Beach is the town beach, which is very pretty and very crowded, we found most days it quite hard to actually get in as the waves were pretty big, we watched a few people struggle, and our youngest wasn’t too keen so the few times we ended up on the beach, we mainly jumped in the ocean from the pier. Meia Praia Beach, is the largest Beach, you get it it by crossing the foot bridge to the Marina, we went a few times, not sure if it’s always the case but every time we went the waves were huge, my oldest son loved them but I couldn’t relax, Grant got knocked around by some massive waves here, still a gorgeous beach and if you are into body boarding, surfing or kite surfing then this is the beach for you. Lots of restaurants and toliet facilities around. Praia Dona Ana Beach, sadly for us this beach was closed, they are adding more sand and trying to make the rocks safer, we could view it and it does look beautiful, but in my opinion not any more beautiful than Praia Do Camilo or Praia do Pinhao Beach. 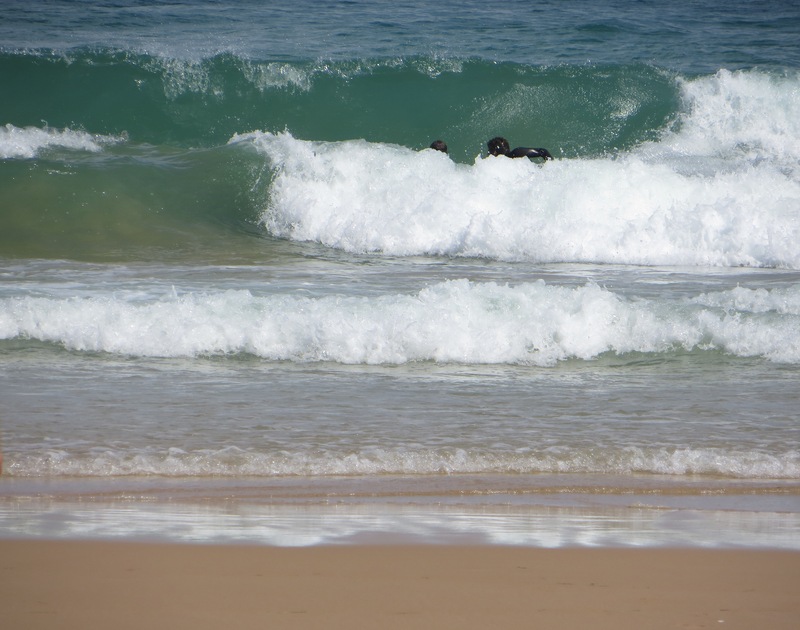 We had lots of fun in our rubber dingy boat and two tyre floats whichever beach we went to, floats we got when we were in Estepona for about 3Euros each and the Boat we got in Lagos at one of the Asian bazaars for 35Euros (including a decent foot pump). Cobbled streets with restaurants, heaving with tourists from dozens of nations, on both sides, the atmosphere here is hypnotic with musicians on each corner, outside many restaurants and in the squares, singing, playing violin, Accordion, guitar and many other interesting instruments. This old town still has retained it’s old traditional features, it is still circled by the city walls that were constructed during the 16th century. Has some gorgeous churches Santa Maria and the golden church’ of St. Anthony which was rebuilt in 1769. We stayed in an authentic Airbnb traditional Portuguese House right in the heart of the old Town. 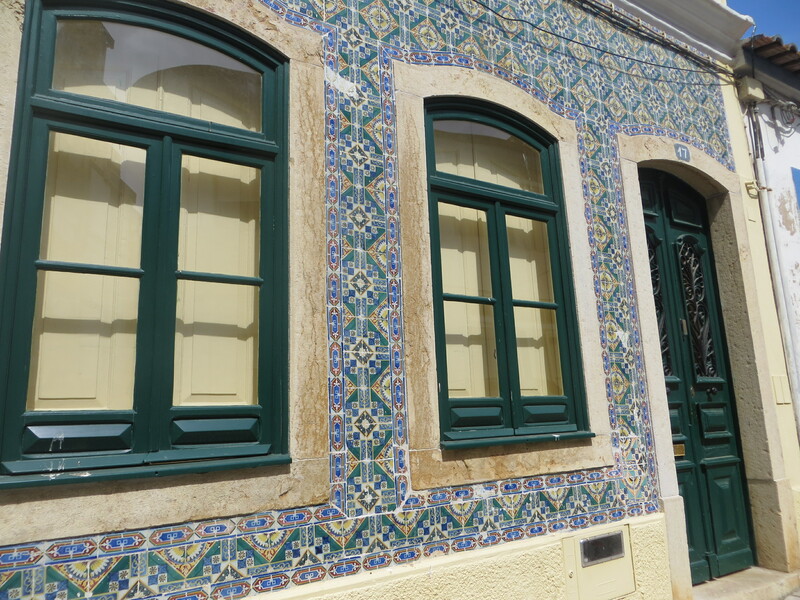 This house is adorable, everyone with a camera who walks past has to take a photo, with it’s tile mosaic front, it really stands out. It has two bedrooms upstairs and a roof top deck with two sunbeds, downstairs has a pleasant living area with high ceilings which feels bigger than it is, separate kitchen with small dining area and bathroom and of course crucially for us it had free Wifi. We had restaurants, bars and cafe’s surrounding us, the buzz is going all day and all night, the place is loud with fun, even the seagulls sound like they laugh out loud, like they are joining in the party. There was every type of restaurant to suit every palate. Lots of little shops selling everything from snorkel and mask, bucket and spades to silly T Shirts and holiday souvenirs, beautiful clothes shops and surf shops. You can hear every nationality as they walk past, it’s a real mix of cultures. Lagos is the perfect holiday for the young and old as there is something for everyone, as we are on a budget we try not spending too much money, but have tried a few things around town.. Mainly for the shopping centre, we had a few things we needed to get sorted, did a bit of googling around, and the reviews said this Shopping centre was pretty good, we did manage to get most of what we needed to do and got a few clothes for myself, was it huge? No, but it was sufficient. Cost 6 Euros for all 4 of us each way by Train. Lucas read about the dog show that was going to be at the International fair in the local news paper and was keen to go, we thought we would go and check it out, it was cute, kids dancing on the stage, clowns on stilts, food from fish and chips to Indian. The dog show wasn’t much, but it kept Lucas happy for a while, it was very hot and the need for a drink took over, he had seen his brother drinking a smoothie that he had to cycle to power the blender and this is what Lucas wanted, so feeling really hot and in desperate need for a drink, he peddled away…he certainly worked for it…all money raised went to charity. The fair was mainly a trade fair set up for expats that lived there with stalls on spa’s, fly screens etc…but all in all we had a good day. Cost 7.50 Euros for all 4 of us each way by Train. 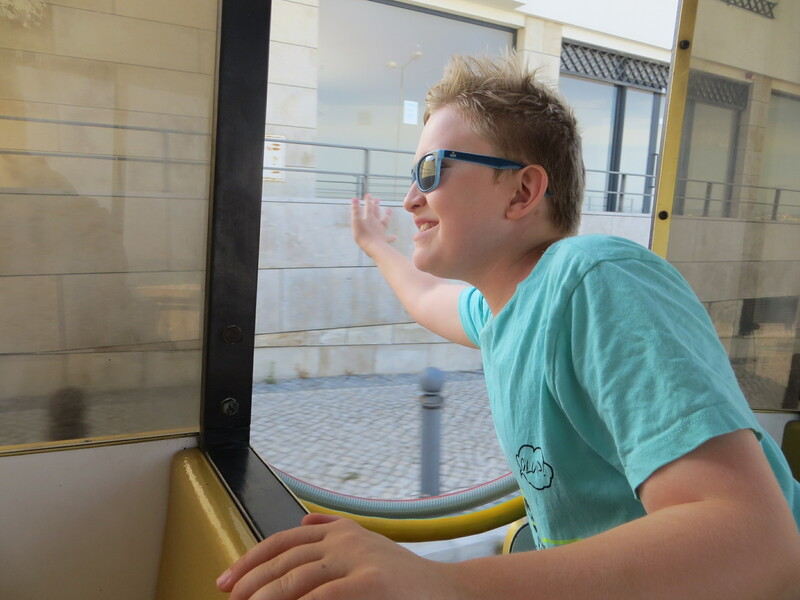 We had to have a go on the little tourist train, it was 10Euros (special price 🙂 usually 3 Euros each), it picks you up from the marina, takes you around the old town up to Ponta de Piedade and back to the Marina, all round trip takes roughly 40 mins, well worth keeping the kids happy waving at fellow travellers out the window. The only thing I would recommend is popping something soft on the seat as it can feel a little like you are going to break the bones in your bum as is goes over bumps or holes in the Road. Cost 10 Euros for all 4 of us for round trip. You have to either walk, Tuk Tuk, tourist train, drive or Taxi to this point, it is incredible, the cliffs are breathtaking, rock formations out to sea and the colour of the ocean, it’s all slightly mind blowing, you can walk down the 182 steps, which we did on both of our visits, at the bottom you can pick up a boat trip that will take you around the grottos. We did the cliff walk all the way back to Camilo beach taking probably a thousand photos along the way. All 3 boys had a go of these awesome little segways, the American owner had a track ready for them to follow and off they went..she mainly does scooter tours but from 4pm in the afternoon she has these set up for the children across the road from the fort. Lots of fun and for just 3Euros for 18 mins (although most times she allowed them on for well over 30 mins). 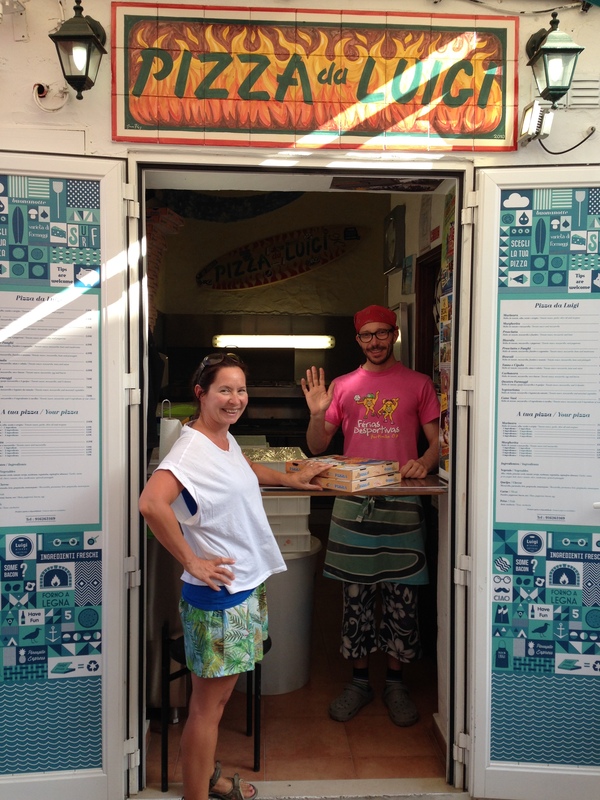 Very friendly and talkative lady, recommended we go to Luigi’s Pizza and that didn’t disappoint. 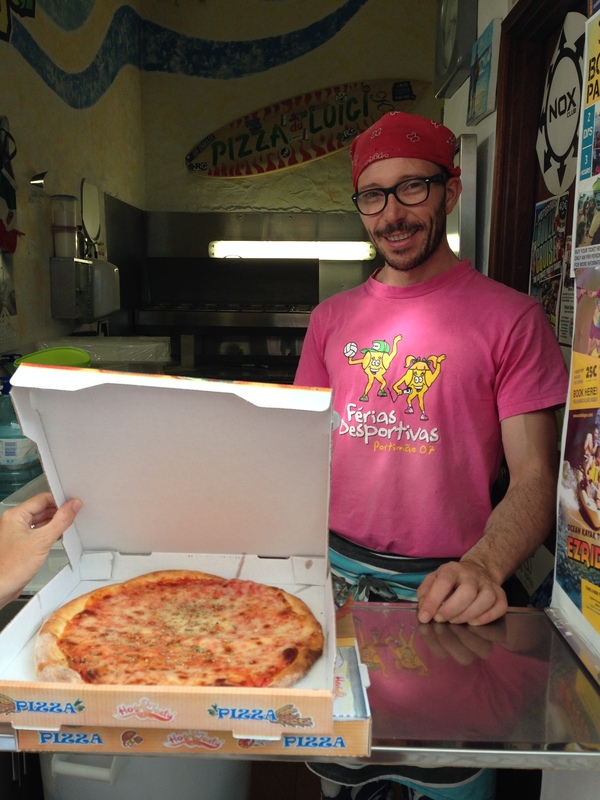 Our kids are pizza crazy, and when we got recommended here we had to treat the boys, Luigi makes everything from fresh and they cost 4Euros, compared to any other pizza we have got since our travels none have been as tasty or as cheap. Decided we had to have a look in the Fortress, built in the 17th Century, in the 1600´s the coast was under regular attack of pirates and corsairs, the Spanish who bombarded the Algarve during the Portuguese Restoration War (1640–1668). This fortress has a small drawbridge to enter from the land and impressive stonework walls. It is now a museum dedicated to some Portuguese Discoveries, there wasn’t much to see but still at 3Euros each it was worth it just for the views and the metal sculptures. We stumbled across a little festival commemorating the death of national literary icon Luís de Camoes on 10 June 1580. June the 10th is a National Holiday and the festival was on Friday 12th June. It was a line of stalls selling food and drink, food consisting of tiny Portuguese snails, these little things were so cute, you could almost see their little faces, I did try one but couldn’t eat his face, even Grant said he struggled when he saw them, but that didn’t stop him, he ate the whole bowl. There were also salted sardines and eel, neither really excited me, but I did try the sardines, I mainly at the Salad that came with it all. Later on in the evening there was music and dancing, it was so adorable, everyone was dancing, the young to little old ladies and little old men with huge smiles. Grant and I joined in…Why not…we had a great time.. Finished your book and need a new read, we found a great little bookstore, it has a huge choice of English books and a few German Books, the owners are lovely and are very knowledgeable on books and the area. Sea kayak trips, which is the one we so wanted to do, but it was going to cost 100Euros for us all, we decided with the house still having not sold we should buy a blow up boat that will last the whole time here and possibly for longer instead. We all love just walking around in the evening, taking in the atmosphere, sitting by the river eating an ice cream and watching the jumping fish or just people watching is great. We do occasionally all eat out on a Friday or Saturday and if we are out for the day then we will have Lunch out also, but eating in really does save us a lot of money, e.g. a home cooked chicken roast for all of us is about 4 euros all up, so pretty tough to beat and Jake and I are pretty obsessed with our curry’s, have found lots of good curry pastes here. It is crazy how much we can spend if we all go out to eat, but still nice to do once in a while. We always take our own water bottles with us where ever we go.